The US Constitution guides the political life of our country and guarantees many of the rights and freedoms we enjoy everyday as American citizens. But, let’s face it: Reading that core document is not exactly everybody’s idea of a fun Saturday night. Seventeen-year old Saira Blair decided to take civics learning into her own hands. With the help of friends and family, Saira put together a campaign and won the 2014 Republican primary against a 2-term incumbent. She now stands to graduate high school in a few weeks and become the first 18-year old elected West Virigina state delegate. Not every high school senior in America can enjoy this type of hands-on government learning. According to NPR, only 18 states allow citizens to run for state office before turning 21. Is 17yo too young to be running for office? Compare age and other qualifications for different elected positions. Begin with the US Constitution. Skip to Article 1, Section 2 and 3 for qualifications for running for a U.S. Delegate and Senator. Read Article 2, Section 1 for U.S. Presidential candidate criteria. Make a side-by-side column chart to compare the minimum age each office requires a candidate to be. List any other qualifications you find. Next, you’ll need to google your state’s consitution and find the section for minimum qualification for state delegate, state senator, and governor. Compare your lists. How are they different? Do you think the criteria makes sense? How could a 17yo possibly beat an incumbent? 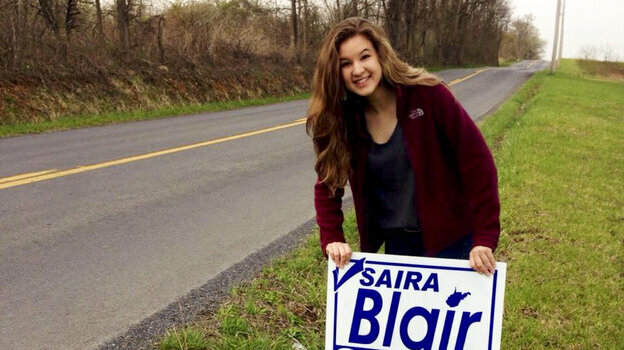 Read the Washington Post story on Saira Blair’s win. Compare it to the Fox News story. Discuss what factors may have helped Blair win the primary race? Was it the difference in campaign spending? Did social media work in her favor? Or, did she benefit from an “old boys’ network” in some way? Check out the law in your state to see how old you must be to register to vote. Mid-term elections might not hold as much excitement as Presidential elections, but they are crucial for local politics. How are you exploring the Election Process today? This entry was posted in Current Events and tagged civics, election day, politics by alessa. Bookmark the permalink.